The stitch is the same old chain stitch,but the usage is a little different .Earlier I'd used chainstitch filling in my Kashmiri work pattern .That's the regular technique of filling with chain. The simple chain stitch interlaced with one another. What do you think? This was my first attempt.This technique works well if you have a focal point. I did not like the colors I had picked and was almost on the verge of discarding this half done. Another pattern with the same technique. I used both the filling styles on this one. The blue arrow points to honeycomb and the green arrow shows the regular one.Isn't there an obvious difference? The black drawing is an attempt to show you how the lacing is done.The first line would be a row of simple chain stitches. The interlacing starts from the second line.Each chain passes through the one beside it. Did you notice the shading on the bud? So, what do you think? Have you seen this method somewhere before? Do you know what it is called? In case you know the actual name of this technique do let me know. Chain stitch is the featured stitch of TAST this week. When it was run in 2007 I had stitched a sampler of complete chain stitch family . You can also make tiny little roses with chain stitch - the tutorial is here. Do let me know if you're trying out this new method or the little roses,I would love to see your work. I have never seen this done before Deepa - it's very pretty and works so well as a filler. Maybe you've invented something new!! I love the honeycomb look and I'm going to try it out right now on a current project. Great tutorial, Deepa. Never saw this before, I like it! Thanks for sharing. 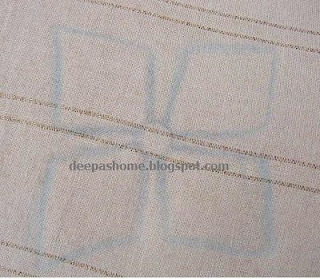 The filling stitch with chain is very nice Deepa. This is excellent , ll try it soon..
Wow! This is great! It gives the chain stitch fill almost a fish-net look. In all my armchair crafting (reading really cool books about crafting topics without actually doing most of it), I have not seen this. I like it a lot and it is very clever! Your honeycomb chain stitch is wonderful You are such a clever stitcher. i have never seen this anywhere else. I think it could be original. How nice, I love the result. I will give it a try, it looks perfect for quickly covering empty areas. Nice filling stitch. I have also tried this interlacing before but it was a flop. Again I will give a try and show u. Thanks deepa. This is fabulous! Both the filling and honeycomb variations look beautiful. The honeycomb version reminds me of needle lace for stumpwork. Your designs and colours are beautiful. Love the interlacing chain! I'm going to have to try it. I've never seen it done before, and this is lovely, Deepa! This is a most beautiful way to work the chain stitch. Thanks for sharing. Loved this, deepa..It s a pretty nice filling stitch. Liked this more than the regular chain stitch fillings..Havent seen this before. Got to try this for sure..
You've inspired me to try another variation. Of course I put a link to this post too. great way of creating a netting!! I love the "Deepa Chain Stitch". I am a bit late in completing my Tast Chain stitch for last week, so will have a go at Deepa Stitch! Congratulations, it is a lovely lacy way of filling shapes. Very good idea ! I like the effect of this stitch, very lovely. I just found your lovely site and I talked about it on Stitchin Fingers. I hope it was okay to show one of your photos since I provided your blog address. I would have asked first but I got all excited about your chain stitch rose from my researching yesterday. you call them samples and I call them minature works of art. this chain stitch looks a little like needle weaving - I'm going to try it soon. Oh, these are just lovely! The chain makes a great filler! Thanks for your message on my blog. I'm enjoying Anita's stitch-along. I also like what you are doing too. A year or so ago I filled in an area with chain stitch and to me it looked like knitting! It certainly looks like needlelace too. Deepa, this is one I will have to try one day. Thank you for sharing. LOVE* this...great fabric, great finish. I love everything about this.